• Price per room or studio is based on season, views and size. • Cost is for 1 or 2 persons per room, per night in Euros. • Breakfast is included in the price. • Cost includes all taxes. We will make every effort to accommodate special requests. Please advise us at time of booking. All cancellations should be confirmed in writing. The hotel reserves the right to withhold the cost of one night’s accommodation for cancellations received less than seven days prior to check-in. To make a reservation, call +30 22460 72088 or send us an email with your requirements to . You will normally receive a response within 36 hours. 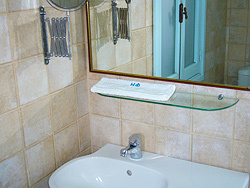 The Hotel Fiona is a small, friendly, hotel nestled in the upper town of Chorio in Symi Island. Most rooms have private balconies with magnificent views of Symi harbour. Rooms at Hotel Fiona are all fully air-conditioned, with en-suite bathrooms and mini fridges. AUTHORIZED LICENCE BY GREEK MINISTRY OF TOURISM.